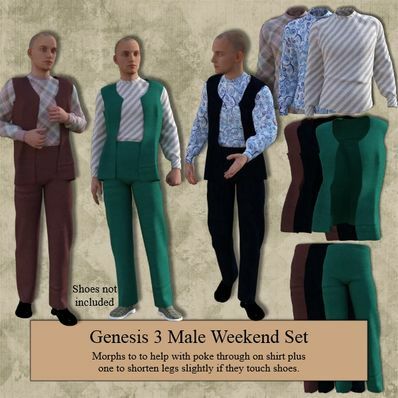 Weekend Set for Genesis 3 Male for use in Daz Studio 4.8. Morphs for dealing with poke through on shirt plus one to shorten legs slightly if pants touch shoes. thank you very much .very generous freebiesite!!! Thank you very much! Looks great! Pants should touch shoes and crumple slightly at the break. I wouldn't be caught in these clothes on the weekend. I do appreciate your work in all these props and costumes you have made. The perfect set for many occasions. Thank you very much! Just what I need for a male figure! Thanks! Thank you. Love the look of the waistcoat, could work as medieval, pirate, all sorts, as well. Very cool! Thank you very much!